Despite the bitter winter in South Lick, Indiana, business is still hot at Robbie Jordan’s restaurant. But when another murder rattles the small town, can Robbie defrost the motives of a cold-blooded killer? Before she started hosting dinners for Indiana University’s Sociology Department at Pans ‘N Pancakes, Robbie never imagined scholarly meetings could be so hostile. It’s all due to Professor Charles Stilton, who seems to thrive on heated exchanges with his peers and underlings, and tensions flare one night after he disrespects Robbie’s friend, graduate student Lou. So when Robbie and Lou go snowshoeing the next morning and find the contentious academic frozen under ice, police suspect Lou might have killed him after their public tiff. To prove her friend’s innocence, Robbie is absorbing local gossip about Professor Stilton’s past and developing her own thesis on the homicide—even if that means stirring up terrible danger for herself along the way . . . I received a free copy of this book through netgalley and voluntarily reviewed it. 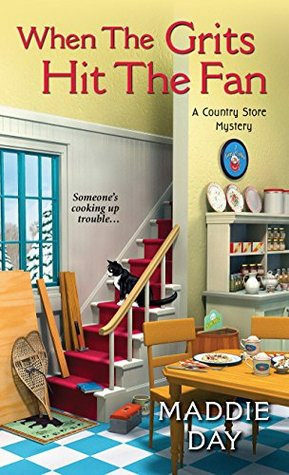 This is such a good cozy mystery series and I am always eagerly anticipating the next book. When this book popped up on netgalley I hit request as fast as possible. This book is just as good as the first two books, maybe even a bit better. I felt really invested in this story. The mystery kept me engaged and guessing who the murderer was. I really enjoyed this book and did my best to try and figure out the murder mystery and actually managed to predict who the murderer was before the main characters did. It was fun! The mystery in this one is very good! A professor has been killed, but quickly it turns out he wasn’t the nicest person and a lot of people dislikes him. So lots of people are potential suspects. A friend of Robbie has been seen arguing with him the night before he got killed and she’s one of the suspects. I liked how Robbie got involved in this one. It feels pretty realistic and I liked following her reasoning and how she tries to figure out who did it. There was one clue which Robbie didn’t seem to pay as much attention to, but it was the clue that I mostly used to reach the conclusion of who was the murderer. For a while I suspected others, but then there was a scene that for me felt like it ruled out that suspect and then I narrowed it down to the right one. I do admit I actually tried to figure out the murderer here, while normally I don’t try as hard to figure things out, so that’s part of the reason I figured it out. I liked how there were enough hints and clues to figure things out yourself, but it wasn’t too obvious either. And I only reached the right conclusion a few chapters or so before the characters did. Besides the mystery there are some other plot lines going on. Robbie is tearing down the walls of the space above her restaurant as she wants to convert it to space for rooms. Then there is her relationship that’s progressing a bit. I really like these two together, the romance was a nice touch. It stayed pretty much to the background, but I liked how Robbie her relationship and friendships play a role each book. It’s always a pleasure to return to this series and visit Robbie her restaurant and read about the yummy food she prepares. I can always vividly imagine how it looks like and I enjoy reading about her puzzles, cooking and other adventures. After reading the book I can also say the cover is a nice fit with it featuring the stairs to the next floor, snowshoes, Birdie the cat and some rubble. Which all plays a part in the story. I also liked the winter weather in this book and I can only imagine how pretty everything must look like. To summarize: This was another great installment in this series. I really enjoy this series and it’s always a pleasure to return to it for another book. The mystery in this book was very well done and I put some extra effort into trying to figure out the murderer. After a while I managed to decide who I thought was the murderer and it was fun when that suspect proved to be the right one. The mystery had enough clues to figure things out, but it wasn’t too obvious either. Besides the mystery there are some other plot lines going on, like Robbie her romance and how she’s tearing down walls on the floor above her shop as she wants to renovate the space. It has a nice mix of mystery and other topics and I like returning to this town and the familiar characters. I am already looking forward to the next book! You can also read my review on Goodreads. What’s the last book featuring a restaurant or store that you enjoyed? Oh, the small town and country store setting sound great. I like what you’re saying about how she is able to slip into detecting mode and it suits the story and the character. Neat that you were able to track the clues and come up with a solution for yourself. Ha! Just DNF’d a book where one of the characters ran a general store in a Caribbean Island small town. I liked that part of it and even this character who owned the store. The clues were well done in this one and it was fun to be able to guess the murderer. The country store setting is great and I like how the main character gets involved in the investigation, it felt pretty natural. I am sorry to hear about the DNF! The store part did sound nice at least. I usually like reading about characters who run a store or business. This sounds like a really great series. I’ve been contemplating reading one of the books. I’ll have to add this to my TBR. I have the first book in that series by Gayle Leeson on my to-read list. It sounds good! That’s a great title, make me laugh. I think the last book I read that had a store in it was Shadow Rider by Christine Feehan. The heroine has a bakery. It is a great title indeed :). That sounds like a fun one with the heroine who has a bakery! I’m glad you’re having fun with this series. It’s sounds like a cozy mystery series I would enjoy. I think the last book I read featuring a restaurant, it was actually a tearoom, was a cozy mystery from Laura Child’s teashop mysteries. I love it when characters have business that tie in with the mysterious. It’s a great series so far and I am always excited when the next book comes out :). I also like reading about characters who have a business of some sort. A tearoom sounds fun to read about as well! Sounds very intriguing here…I do love seeing a good mystery along with other plot lines too!! And I like the setting too…very charming. Me too! It’s nice when there are some other plot lines going on besides the mystery as well. Sounds like a great mystery! And that’s awesome that you figured out the murderer. It always makes me feel like a genius when I figure things out before the characters (as long as the thing isn’t too obvious, which is sounds like it wasn’t in this book). And sometimes it’s nice when the romance is there but just in background. Plus a restaurant owner, how cool! That does sound fun to read about. Yes I always feel smart when I can figure out who the murderer was, although in a part it’s also because of how the book is written. Some mysteries you almost can’t figure out as there aren’t enough clues in the right direction, here you could, but it wasn’t too obvious either. It’s no fun when it’s too obvious. It’s fun to read about her job in the restaurant and the romance being there in the background works great for this series.